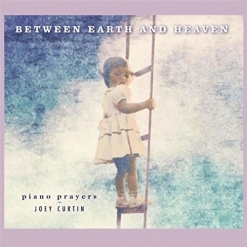 Between Earth and Heaven is an outstanding solo piano collection by Joey Curtin. The album features six original compositions and three arrangements of pieces from the Public Domain. Subtitled “Piano Prayers,” the album is dedicated to Curtin’s close friends who were also her next-door neighbors. Brad was diagnosed with cancer in March 2017 and died in July. “Playing piano was the best way that I knew how to pray for him and Jayne.” What an amazing gift! The album’s title and subtitle might suggest that the music is quiet and/or somber, and it’s a bit of both in places, but each piece is expressive and often passionate in its own way. 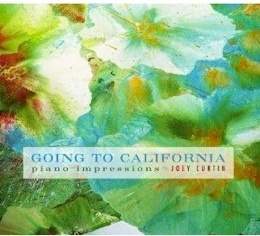 I really love this album and look forward to having Joey Curtin play in my house concert series this fall. Currently residing in Washington State, Curtin began her music career in the SF Bay Area and has performed in such diverse places as the Ansel Adams Gallery and Ahwahnee Hotel in Yosemite, The Sheraton Palace in San Francisco, and Sheraton Addis Ababa in Ethiopia. She has performed and had speaking engagements all over the world and her music has been part of Peace and Reconciliation meetings in Northern Ireland. She also composes music for sound libraries. Between Earth and Heaven begins with “I Feel the Winds of God Today,” a public domain melody that was also recorded by guitarist Phil Keaggy. The track begins with a simple melody line and broken-chord accompaniment that become a bit more complex with each verse - a gorgeous and heartfelt opening. “David’s Harp” was composed for Curtin’s son, a guitarist. The rolling chords in the left hand are the perfect accompaniment to the strong but gentle melody. “Jacob’s Ladder” is for Curtin’s daughter and was composed on the black keys, thinking of them as rungs on a ladder. A bit more uptempo while maintaining a dreamy mood, it’s a favorite. “Mulberry Jam” is about overcoming death with joy. Not surprisingly, there is a mix of emotions expressed, but the piece is uplifting and reassuring. “First Dance” begins tentatively with an easy swing rhythm, gradually evolving into a livelier, jazzier and more confident theme. I really like this one, too! “Missing Vince” was composed for the late jazz pianist, Vince Guaraldi and is based on his composing style. Guaraldi was best-known for writing the music for the various animated “Peanuts” TV specials as well as for “Cast Your Fate To the Wind.” Curtin didn’t incorporate any of those themes into her tribute, but created her own music in Guaraldi’s honor. “A Thin Place” is a Gaelic term for special places on earth where the presence of God is strongly felt. Curtin composed this piece for her father-in-law while he was in hospice. Warm, soothing and reflective, it’s very beautiful and played with deep emotion. “Bound For the Promised Land” is the second arrangement of a Public Domain piece. Played with passionate expression that ranges from tender to powerful, it’s a very evocative piano solo. “Wayfaring Stranger” is one of my favorite folk songs, and Curtin’s solo piano arrangement expresses feelings that transcend words, communicating directly from one heart to another. This is definitely my favorite piece on this album and brings it to a very satisfying close. Between Earth and Heaven is excellent from start to finish! It is available from Amazon, iTunes and CD Baby. Highly recommended!